Retaining rings, or circlips, are spring-type fasteners that hold components or assemblies onto a shaft or in a housing/bore when installed in a groove. Once installed, the exposed portion of the retaining ring acts as a shoulder which restricts the movement, or retains the specific component or assembly. Search thousands of Retaining Rings & Clips in the FCH database of surplus, odd lot, slow-moving and hard to find fasteners. Click one of the links below to find everything from External Push-On Retaining Ring to Split Cotter Ring, Split Ring, Ring Cotter, Rue Ring from hundreds of fastener distributors. Many FCH Network Member companies sell their Retaining Rings & Clips directly to end users, and others sell only to other distributors. Some list pricing information and some do not. 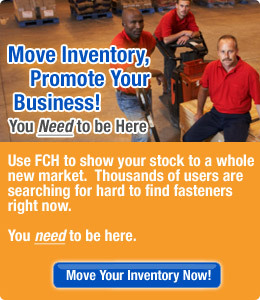 The database is open for search by anyone with an internet connection, however members who login to the website receive additional benefits and more extensive fastener listings.